Hestra amry leather Heli-ski Lobster 3 Finger Mitt. Condition is Used. Well used, see pictures- white leather palms no longer white! Inners in good condition. Size 9/ large. Will fit hand length 19-20cm. Comes with leashes attached. £45 ONO. Hestra Army Leather Soft shell glove. mens ski gloves. Size 9 (LARGE) Condition is Used, but are in excellent condition, with no wear scuffs. Dispatched with Royal Mail 2nd Class. £90 when new from Ellis Brigham. "Sophisticad glove delivers all weather performance and all day comfort. Stretch softshell with tough goat leather palm and reinforcement. CZone waterproof and breathable construction. Thermalite / fiverfill insulation." Hestra Kids Mits size 4. Smoke and pet free home. Any questions please ask! Our all-natural Hestra Leather Balm is formulated to protect your sport gloves and is a great way to prevent leather from drying out. Prolongs the life, suppleness and water repellant properties of the leather. Sirius Polar Mitt. Also features removable wipe pads for nose or goggles. Made of durable goat leather and canvas fabric. Removable wool liner inside. Harness with carabiners. 2-layer wool lining 100% wool. Hestra Army Leather Gore Tex Mittens. Black, VGC, Size 6. 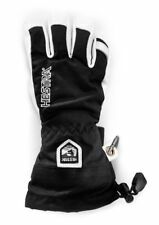 Hestra Army Heli Ski 3 Finger breathable, waterproof leather gloves.